This is exercise #5 in our series on Core Strengthening Exercises – the side bridge. If you do all of the exercises in this series daily your core will be super strong… But like with everything in life you do need to do it daily for it to be effective … you got to do it and keep doing it to stay strong. if you have any questions as usual please don’t hesitate to call or send an email! Actually that site looks awesome – I am going to have to recommend it and make a bunch of things from there now… let me know if you do and we can post more! Transfer the onions, garlic and sweet potato chunks into a blender, and add the rest of the ingredients. Blend well, scraping down the sides, until everything is creamy. Adjust seasonings to taste and set aside– this is your curry sauce. 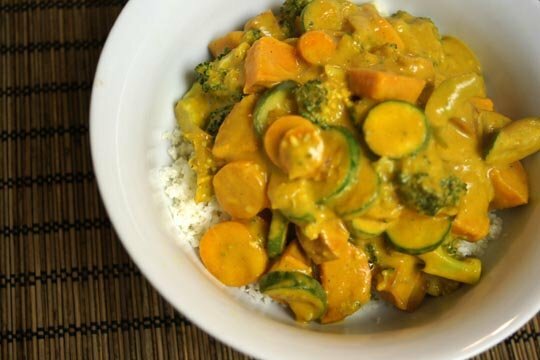 Once your veggies are nearly cooked, pour the curry sauce over them. Bring the sauce to a simmer, then reduce the heat and cover, to let the flavors blend for about 5-10 minutes. Your veggies will be nice and tender, while packing a huge punch of flavor! The best part of curry dishes, if you ask me, is eating it the sauce with rice, so even if you’re not eating grains, you can still enjoy this curry sauce over a bed of cauliflower “rice!” (Simply pulse raw cauliflower in a food processor, until you have a rice-like texture.) Pour the curried vegetables over the rice and serve warm. These extra bits make all of the difference in activating the proper muscles including a muscle called the transversus abdominus which really helps to activate the whole core (anteriorly and posteriorly). crunch and lift your shoulders slightly off the floor without moving your neck into flexion. Ok so why with the tongue thing? It makes it so you can’t engage your neck muscles and you have to use your core. This is the way you were always supposed to do crunches. Who knew right? for a step by step how to please see my YouTube video below! 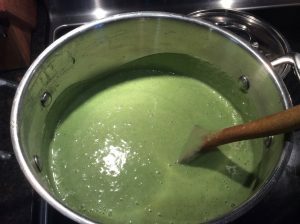 This recipe is one I invented and posted last weekend – for broccoli and potato soup with more green than I am used to as I added spinach! It turned out great and I have a ketogenic twist on my original recipe that worked really well!. AND it has the added bonus of deliciousness! Throw everything except spinach into a pot and boil, making sure the water/stock covers the veggies fully. Boil until everything is really soft and at the very end throw in all spinach and wilt. Then place all chunks and liquid in blender and blend until smooth. There you have it a healthy, green, ketogenic friendly if needed home made delicious soup! Mix all ingredients and pour over spinach. In our series on core stability we are on week number 3 which brings us to Resisted Side Stepping. This is a great core stability exercise and this chiropractor gives it to many of her patients to build good core strength. Good core stability helps prevent lower back pain. If I am really lucky I have finally figured out how to get my own YouTube Channel, upload this video and imbed the link in this blog post. I have been trying to make my videos short but feel rushed and they end up being too long for this site so hopefully this is a tech solution for this chiro who is trying to learn the tech! Ok so for this exercise you do need one piece of equipment and that is a resistance band. 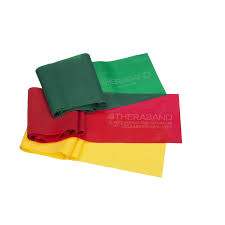 You can use a large rubber band like I have in this video or something like theraband which is easily found at a sports store or your chiropractors office in many cases. Start with a light resistance because this silly little exercise can be quite challenging. If you have no idea what I am talking about when I say resistance or exercise band see the picture below – it is essentially stretchy material that will provide resistance at the ankle level during this exercise. Start by bracing – that is contracting your stomach muscles (see exercise #1). Then hands on hips, band around ankles and bend knees. Take steps to the side one direction 5-10 times and then the other. Make sure not to waddle! So this is core stability exercise #3 – as always if you have any questions please don’t hesitate to call and ask or contact us for more information or help. This recipe came from a good friend of the family my Auntie Janet – it is my mom’s recipe for spare ribs which I don’t even think I have so what a treasure! I remember eating these as a kid and they really are amazing – they were a once in a while treat for us that my family still remembers fondly. 1. Brown the ribs with the garlic in the bacon fat. Core stabilization is super important – in keeping with out theme here is exercise #2. Please watch the video below click the words “Bird Dog ” that are underlined and a video screen will pop up. This is the weird name of the exercise… once you get your legs going and it is easy for you, for an increased challenge add the opposite arm. For an even more difficult exercise hold for 10 or more seconds in each posture. The important thing to know here is that one side will be harder to do than the other side. You will want to cheat when raising one of your legs and drop your hip to achieve it. This is because the gluteus medius is weak or not activated and this exercise helps us reactivate it. This in turn also turns on the Transversus Abdominus muscle… that is all chiro speak for core stabilization. These muscles, if strong, lead to more stable cores and less back pain. So just do it already! Add all the other ingredients and season to taste. Let marinate for 3 hours before serving at room temperature. Nice as a side to anything.